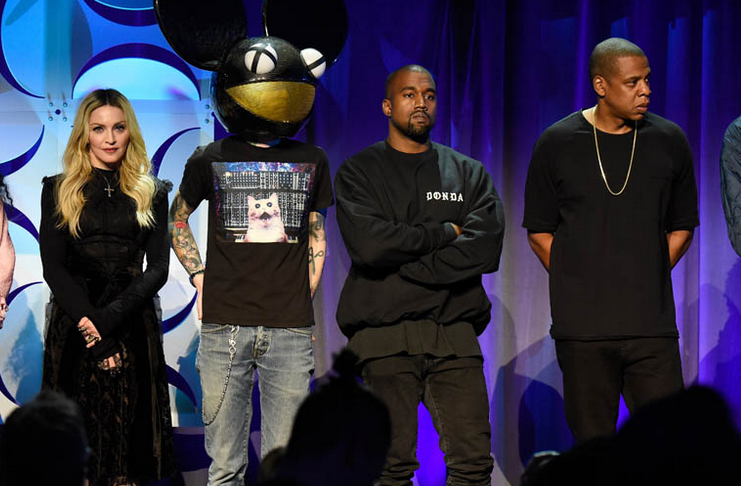 The above image was captured last week at the re-launching of the TIDAL music streaming service. While this is but a moment in time, it does provide a very useful body language teaching moment. Madonna is standing in a modified fig-leaf position. She is of course, a very alpha personality - yet in THIS particular moment, she's definitely feeling more beta and with a lower confidence level than she's been on many an occasion. Deadmau5 is standing with his hands in his back pockets and his thumbs-forward. This is a good alpha-beta hybrid stance and shows a high-confidence, but not one that is too high or too assertive. Kanye West is standing with his arms crossed in front of his chest and without his hands visible. This signals he's defensive, closed-minded and - when we correlate this with his facial expression - we can say that Kanye is also feeling threatened and impatient. He wants out of this spot-light. He feels very beta and acquiescent to Jay Z's alpha, intelligence and relatively superior social skills. Jay Z has his hands behind his back. We cannot tell how they are clasped, yet we can say this is a very confident, alpha stance. It sends signals of leadership and strength - yet as with all alpha signals, if this is over-displayed (for longer durations) - it will transmit signals of hyper-alpha mindsets, arrogance, aloofness, and condescending emotional tones. It's not surprising that he's standing this way since he's the principle business actor of the new Tidal music-streaming service, but he should not remain this way for too long.